The Abel Tasman National Park is located on the north-eastern tip of the South island in New Zealand. It extends from the small township of Marahau to Golden Bay. It offers over 54 kilometers of golden sands, such clear water you’d swear you were in the tropics, and a coastline that is fringed with magnificent marble and granite rock formations. 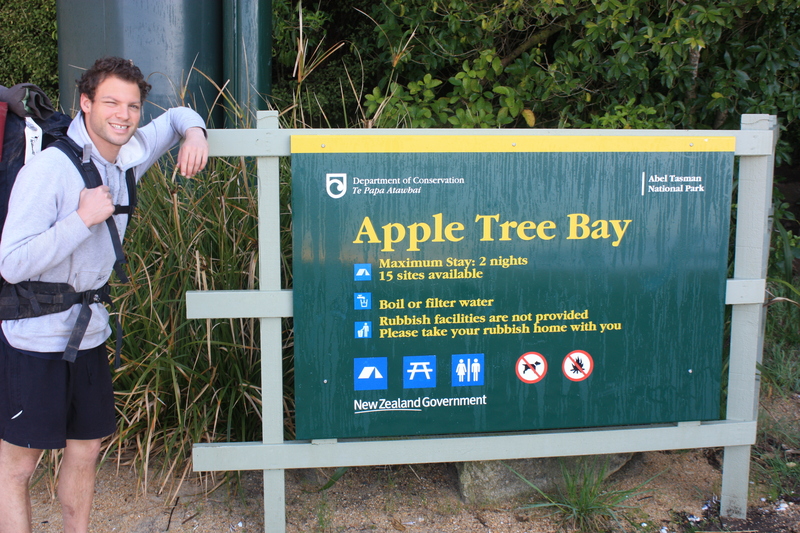 I must have done the Abel Tasman Track over ten times throughout my life. There are photos of me as a baby on my dad’s back, smiling out from the outlook down to Bark Bay. I have been with girlfriends, family, friends, and even with school. I have done it in groups of every size and I have done it alone. This is not to say it’s a river of people flowing up and down the path in every direction. Even in the busiest season (November-April), I have found myself alone for sections of it. 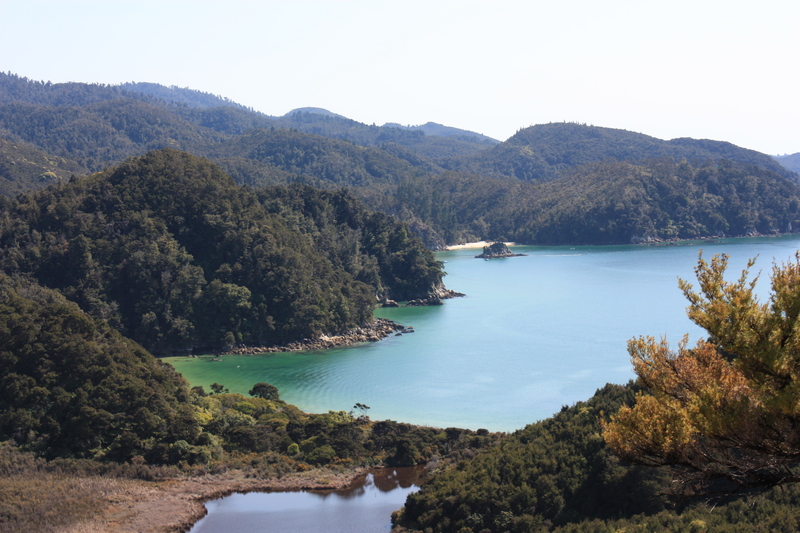 For the amount of time I’ve spent in the Abel Tasman National Park, no one time is ever the same. I have never gone there feeling like I had seen it all before. The number of days one can spend on the track is anywhere from one strenuous day from start to finish, or from three to five leisurely days taking in every campsite that this magnificently serene coastline offers. The Golden Bay area boasts some of the warmest weather in the South Island, averaging 25 degrees (Celsius) in summer and 15 degrees(Celsius) in winter, making it an ideal hike year round. New Zealand is notoriously one of the most beautiful places on earth and I don’t lie when I say that this part of the country is my favorite. Getting to Marahau and the start of the trail is fairly easy and is a beautiful drive. Just as an aside, you can do the hike from the opposite direction or start at Totaranui in the middle, which is accessible by road. But for the purposes of this article, I will be starting at Marahau at the north-eastern side and follow through to the end at the north-western side. The journey usually starts in Nelson, which is the last major city (before the small townships of Motueka and Kaiteriteri closer to the trail) where you can book all water taxis, campsites and cabins at the visitor center. Nelson itself is a cool town with a great vibe, fresh seafood, nice beaches and has fantastic markets every Sunday from 8am to 1pm. My favorite hostel is Paradiso Backpackers, located at 42 Weka street (03 546 6703). It is fully equipped with a swimming pool, volleyball nets, teepees, fun comfortable rooms, great atmosphere and more importantly, a hot tub and sauna, which is the most incredible thing in the world after 5 days on the trail. From Nelson, you can catch the bus directly to Marahau and the start of the trail through a number of bus companies. The easiest and most frequent are the intercity buses. If you are driving, make your way along route 6 through Richmond until you reach route 60 which will take you to Motueka, a small hippie town which is the base for majority of New Zealand’s apple and hop produce. In fact, I spent one summer there living in a caravan on an apple orchard, thinning the trees in preparation for picking season. If you have time, stop in Mapua before Motueka and get some mussels – yum! The road to Motueka is a beautiful drive through seaside estuaries and orchards and takes about an hour by car to reach. After stocking up on provisions, you have two options: either take the hilly but probably shorter route up over the Riwaka-Marahau road, or the longer but coastal Riwaka-Kateriteri road which takes you past Kaiteriteri, a picturesque tiny seaside town and small sample of what’s to come. Either way, you’ve made it to Marahau! Abel Tasman Aqua Taxi offers free parking behind the safety of its domain if you have a water taxi ticket (maybe even if you don’t, but you usually do as discussed ahead.) So park your car and start hiking. 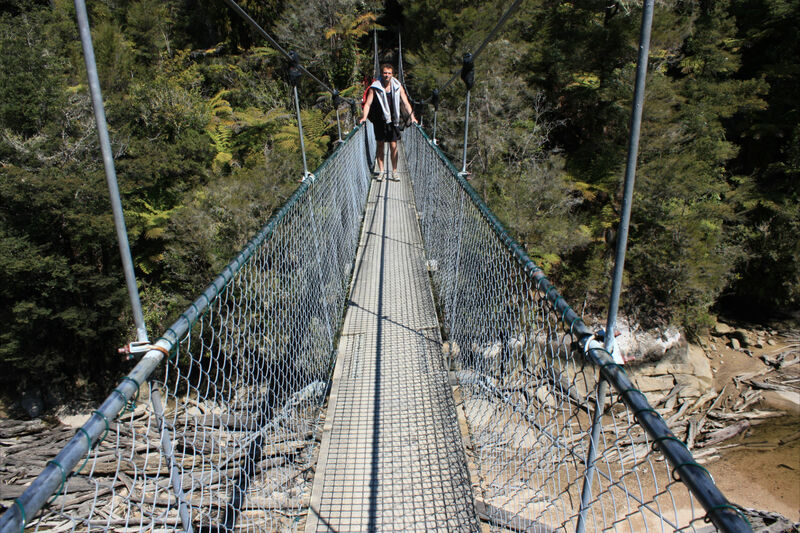 You keep walking down the main road of Marahau until you reach the start of the trail, just over the bridge. There is a great café at the start of the trail, which if you are hiking in from the other direction is the perfect place to grab some well deserved beers and nachos. The first leg of the hike is most likely going to be the 3-4 hour hike from Marahau to the first of the large campsites at The Anchorage. The track starts at the Marahau information kiosk which leads to a boardwalk that cuts across an estuary before the actual track begins and you enter into the bush. The first small campsite is at Tinline Bay, which is equipped with bathrooms. I should mention now that the trail has really stepped it up over the years with many of the campsites offering running water (many with drinking water) and flushing toilets. As hard as some legs may be, it certainly isn’t “rough as guts” hiking. The track then rounds Guilbert Point which is a nice first lookout, giving you a glimpse of what’s ahead. Only on a few occasions have I stopped to camp before Anchorage and it has only been due to daylight hours left that I’ve had to choose either Tinline, Coquille or Appletree Bay. Of these, Appletree is my favorite. There is hardly ever anyone else and the tall line of pines, the solitary island in the middle of the bay and the still green waters make it a truly beautiful stop. Even if you get on the trail early at Marahau, the small detour from the main trail is worth it to take your boots off and have a snack or a dip in the sea. There are a few uphill slogs from here on out but ain’t it rewarding when you reach the exposed ridge and have those epic views down to The Anchorage, your first spot! This is your first sign of civilization so far, with the few yachts anchored (hence the name) and the ranger huts and hikers cabins. An incredibly steep decent down to the beach follows, and the first sighting of those golden sands, sapphire green waters never ever ceases to take my breath away. Walk down the beach (its signs are well-posted) to the campground where there are a great number of options: some great areas with picnic tables and campfire spots under a canopy of trees, right on the beach and a few fields of grassy lawns, all with facilities. Some favorite memories of Anchorage are from laying out on the beach with my brother. There has always been an inconceivable amount of stars due to its isolation. Another was when my family hiked the whole trail and we stayed out in a boat called Aquapackers in Anchorage on our first night, which offered beers, barbecue and comfortable beds. After an additional three nights on the trail (we were hiking out the way we came) we reached our last night camping back in Anchorage. We were all dreaming of proper food and beers at which point my Dad gave me a twenty and told me to swim out to the boat and pick up some beer, which I did gladly. I remember the sun setting, a six pack under my arm as I swam back to the beach to provide for the family… Don’t count on this though, I’m not sure it was within the Aquapackers rules to do this! Most maps that you SHOULD have picked up (when booking or online) will tell you what campgrounds have what facilities, and more importantly, the tide times. One of the best parts of this trail, and definitely a characteristic that differentiates it from other trails, is that there are numerous estuary crossings which can only be crossed on low tides. It is safe to cross the estuaries 2 hours either side, however, ideally the closest to peak low tide is best. I have been caught hauling my backpack overhead due to incoming tides. The first stretch of the next leg is to walk along the beach and over a small ridge to Torrent Bay Estuary (where aforementioned tidal mishap occurred). Take off the shoes and enjoy the wide open expanse of walking on the oceans floor, surrounded by an arena of evergreen trees. It never is completely dry, so expect a little stream wade at the very least. 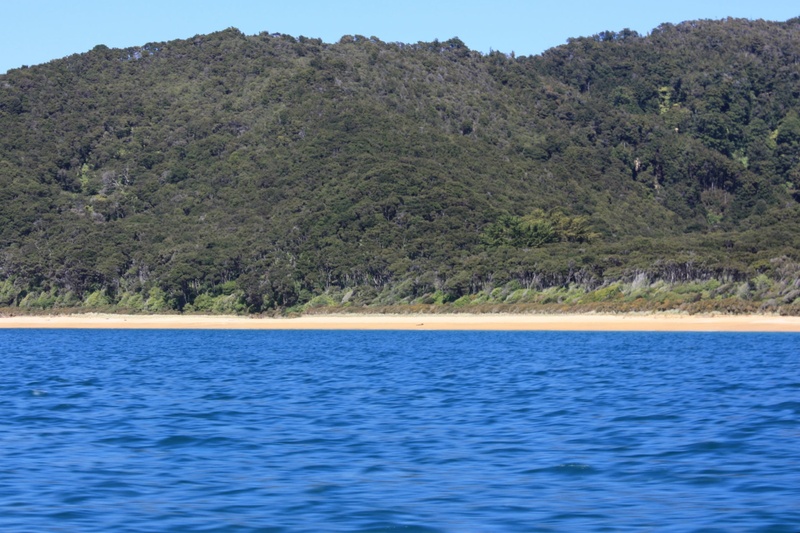 There are two areas (Torrent Bay and Awaroa) in the Abel Tasman National Park where some people are lucky enough to have private residences. Once on the other side of the estuary, you’ll be getting a little green eyed at these classic kiwi holiday houses nestled between native bush right on the beach. Torrent Bay is great for swimming and is particularly picturesque, with the island in the middle and the ever-changing tides. The next stretch is one of the most strenuous and one of my favorites. The trail out of Torrent Bay is a steep switchback with stunning views back down to the estuary and beach all the way back to Anchorage. This is where you stop and say “Man! Look how far we’ve come and it’s still so early!” Climb all the way to the top where a bench is waiting. From there, it’s a beautiful hike weaving through the trees on a well maintained path, offering glimpses of small coves and that ceaselessly amazing azure water. After the trail sidles along two great valleys, you will reach a 47 meter swingbridge over Falls River which leads to Sandfly Bay, before the remaining coastal track continues on to Bark Bay. Bark Bay is my absolute favorite! A little finger of land – the ocean on one side, an estuary with an island on the other, so that when the tide is high you are surrounded by water on all sides. This campground is truly beautiful and sheltered by skinny manuka trees. There is a BIG fire pit which is always stocked up with wood and an axe. Drinking water and flushing toilets are available. I have many good memories here as well. Once, when sleeping on the beach under the stars, a seal came right up to us for inspection. I’ve seen dolphins here, played survivor challenges with flaming torches in the empty estuaries, taken freezing morning dips, joined big festivities with fellow travelers around the bonfire, etc. Needless to say, this campsite always has a good vibe and I recommend it highly for an overnight stop. Leaving Bark Bay, you are once more faced with a high tide/low tide option. Check the tide times and skip the walk around the estuary to walk through it to the other side. When crossing estuaries, walk towards the large orange signs where the track picks up on the other side. Usually in Bark Bay the river on the other side of the estuary never goes down completely, so this is definitely a shoes off option. Make your way through the dense bush back up to the ridge over to the Tonga Quarry and walk on to Onetahuti Beach. I’ve camped here once, but I prefer it as a lunch and swim spot. It’s a beautiful long golden stretch of sand, and the campground lies back from the beach, so at times it feels like you are the only one there. At the far end of the beach is a river crossing, so watch for tides (although Onetahuti beach is not the worst place to be stranded). The remaining 5.3km to Awaroa feels longer and it will be impossible to resist an overpriced beer and snack at Awaroa Lodge. I remember a small beautiful wooden and rustic lodge which offered fries and nachos, pizzas and cheap(er) beer, but over the years it has turned into a luxury lodge with five star accommodations and food. If you have a bit of coin to throw around, check it out at www.awaroalodge.co.nz. And as dark as I am that prices have skyrocketed, I still love reaching the lodge, throwing off my pack for a bit of time for beer in the sun. It’s a stellar spot with long wooden tables, a big copper outdoor fireplace and all the produce is grown on site. 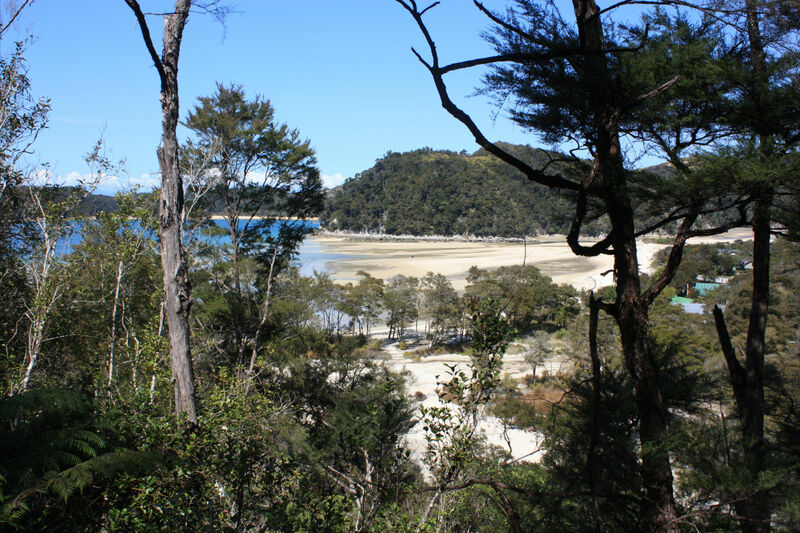 From the lodge, there is a maze of dirt trails cutting through the forest of Manuka that leads to the beach. If Bark Bay if my favorite campsite, then Awaroa is my favorite beach. On arrival, it’s all sand dunes of white sand with clear beautiful water surrounded by lush greenery. The whole of Awaroa is dramatically tidal, the ocean practically disappearing at low tide and alternatively lapping at the trail on high tide, so you have to really plan it if you intend on traveling between Awaroa Lodge and your campsite. From the beach by the lodge, you can walk the length of the beach before crossing part of the enormous estuary, one of the highlights of the hike. This is the one estuary that you want to get to with enough time (and then some) to cross. It takes a good 15-20 minutes to cross the estuary, the bulk of which you will do tomorrow. I have found that from the lodge (and even before the lodge) there are various options to reach the campsite and cabin. I usually opt for following the beach, walking past the private residences (only at low tide). There is an inlet you have to cross to get to and from the campsite to the lodge, unless you want to take the much longer high tide route. The campsites here are usually the dampest on grass surrounded by trees. I usually stay here only because I have come from Bark Bay and am too exhausted to push on, and for the fact that the whole area from the lodge to the beach to the campground is beautiful and options for exploring are endless. My best memory is when hiking with friends we decided for a bottle of wine at the lodge and walked back at night under a full moon across an empty estuary. Beautiful. Wake up, depending on estuary crossing, and go across. When I was younger (maybe still), my favorite part was the deep mud patches. There will always be some water and shallow wading, so bare feet or sandals are needed. 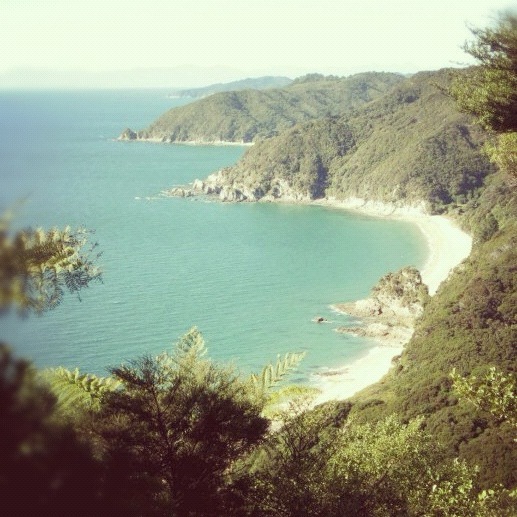 Once on the other side, walk through the dense bush over to Waiharakeke Bay (a camping alternative to Awaroa) and from there the coastal track, which often dumps you right onto the beach picking up the trail at the other end, will carry you through to Totaranui. 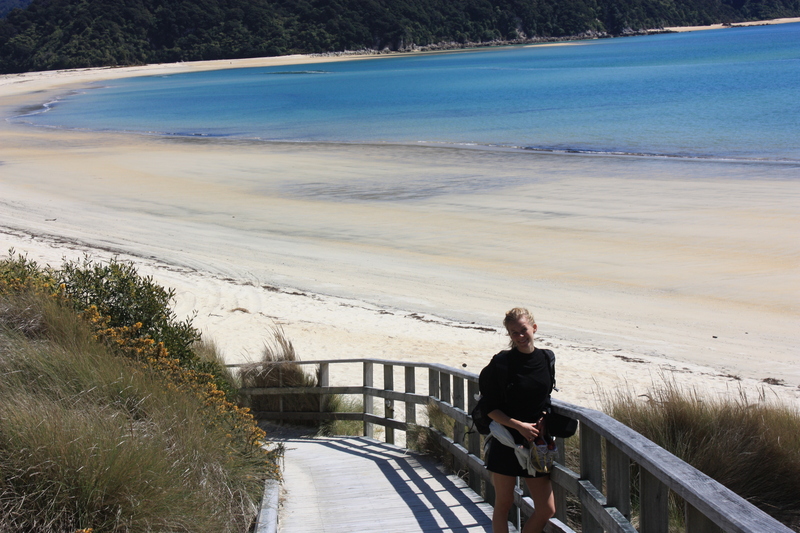 Totaranui is the largest campsite and accessible by road. Many people end their journey here and are picked up by the water taxi to take them back to Marahau. But the best is yet to come! Buy a Coke and a candy bar and get on your way! From here, the crowds drop off and the beaches keep getting more beautiful (if possible). The next part is tricky but incredibly rewarding when you drop back down to Anapai Bay, a stunning, isolated spot. I have been tempted to camp here at times (which you can) but have always had to press on further for lack of time. The people have thinned out dramatically by now and it will seem like you have been stranded in paradise. Walk on until you reach Mutton Cove, one of my favorite spots where I have slept on the beach numerous times. Mutton Cove is the final stop for many, but keep going still! Take the uphill track and walk along to Separation Point, one of the truly majestic viewpoints of the entire national park. It will seem as if you have reached the end of the world standing on a tip of earth with the entire ocean before you. Clamber down the rocks to see a whole colony of seals playing. More than once I have seen whales cruising by. If you are staying at Mutton Cove or Anapai, sunset at Separation Point is a must. Walk on until Whariwharangi Bay, a beautiful isolated beach lined with pines. The track cuts along the beach to Whariwharangi Hut. Whariwharangi Hut looks like an old miners hut with wooden slats and brick chimney. A real back country deal and a perfect place to enjoy your final night. From here you have a number of options. The track actually continues over to Wainui Bay and, after one more estuary crossing, joins with a road that will take you (a bit of a hike on foot, I’ve hitched it without a problem) to Puponga and onto Takaka, where there are more buses that you can arrange at the Takaka Information Center. 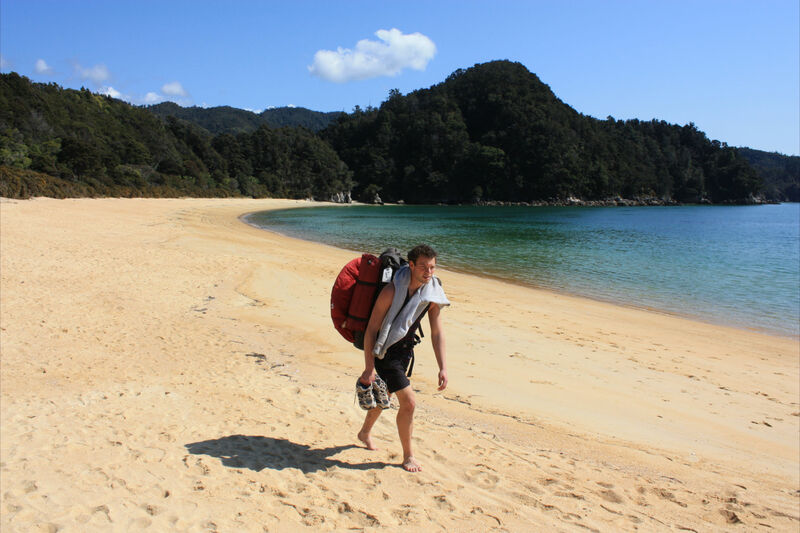 The other option is to hike back to Mutton Cove or Totaranui where a pre-arranged aquataxi will take you back to Marahau. This is highly recommended. It always feels very rewarding to race back along the coast viewing from a boat the long distance you have hiked so far. It’s a beautiful boat ride as well, often spotting seals, penguins and dolphins. I’ve been on a few boat rides where the captain has relished in his local knowledge and taken the boat on a little tour of seal colonies and sights such as Split Apple Rock. Either way, as I say farewell to the coast, I know I will soon return to this trail again another time, awaiting yet one more great adventure.